I had been on the hunt for a good navy eyeliner for years. I was very picky. It had to be the right shade of navy - not too blue, not too dark. There could be no hint of shimmer to it. It had to have really good staying power - no smudging, to avoid that half moon on the upper lid. It had to apply smoothly - I was really only looking for a liquid. 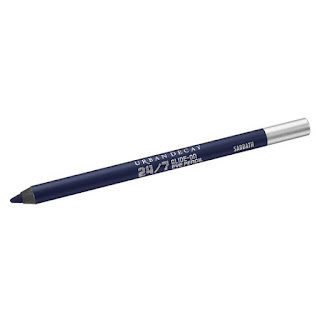 Shu Uemura nailed it with their gel eyeliner and I used it heavily until it dried up, whereupon I discovered to my horror that the colour had been discontinued. That was a couple of years ago and I've been on the hunt ever since. I have looked at dozens, in all price ranges, but found they all had a bit of shimmer (I prefer to have the option of adding my own shimmer, ta) or were the wrong blue. However, I am happy to report that I have found something that is nearly perfect. I'm back to wearing eyeliner at school again, which is a bit of a shock to my students since I don't think I bothered once last year. The liner in question is by Urban Decay. It was a lot more than I would normally pay for an eyeliner pencil, but the colour, matte finish and consistency were too good to pass up. It goes on like a liquid, sets almost immediately and lasts through all the early morning eye-watering, and all day long, until it dissolves effortlessly during my evening face-washing. It even made it through a Bikram class this week. The colour is Sabbath. There are some dreamy colours available, but the list of colour names does make me chuckle. I mean, really. Asphyxia? Does their creative team sit around thinking up the most depressing and dystopian words they can when they're naming products? Yes, I realise I sound about a hundred years old, but it would be helpful to have some indication of the colour in the name. My only issue with it is that it's very difficult to sharpen. The colour stick doesn't seem to quite meet its wooden surroundings, so if it is sharp it is precariously long. A great trick to ensure I use it up quickly. Perhaps I need to buy one of their sharpeners.